The wait is finally over! 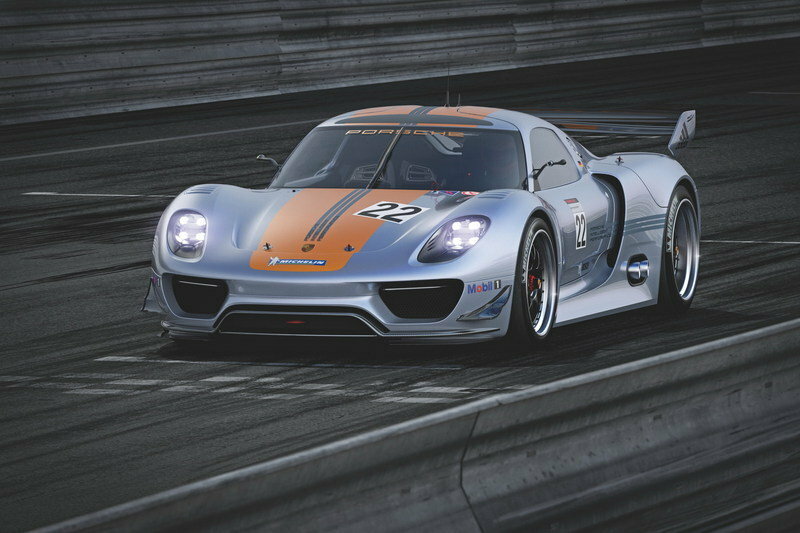 Porsche’s big surprise in Detroit is the Porsche 918 RSR – Racing Laboratory. Starting with the 918 Spyder, the new 918 RSR Racing Lab concept is inspired by models like the 908 long-tail coupe (1969) and the 917 short-tail coupe (1971). The 918 RSR is a hybrid racing car that combines a V8 motor with a direct petrol injection engine and two electric motors on the front wheels. Each of these motors delivers an additional 75 kW, adding up to 150 kW. The whole engine setup delivers a total of 767 HP. The engine is mated to a six-speed constant-mesh transmission with longitudinally mounted shafts and straight-toothed spur gears. The new concept is dominated by muscular wheel arches, dynamic air intakes, and a pulpit-like cockpit. It is painted in a new "liquid metal chrome blue" color combined with typical Porsche hybrid orange color on the brake calipers and the body’s longitudinal stripes. UPDATE 09/08/11: Porsche has unveiled a new video of the 918 RSR Racing Lab with Anthony Hatter, Porsche’s design manager for sports cars, taking us through a quick walk-through of some of the key elements of the 918 RSR. It’s a good watch if you’re looking to find out more about the inner workings of the car. Hit the jump to read more about the Porsche 918 RSR Racing Lab. 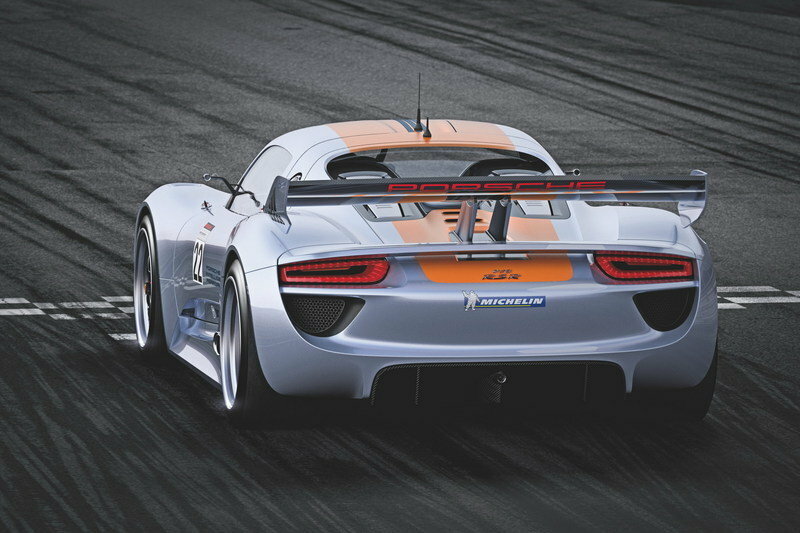 The new 918 RSR concept takes the 918’s design language a step forward. It is defined by muscular wheel arches, dynamic air intakes, and a pulpit-like cockpit. There is a visible fan wheel between the ram air intake tubes and a rear spoiler showing that we are indeed talking about a racing model. 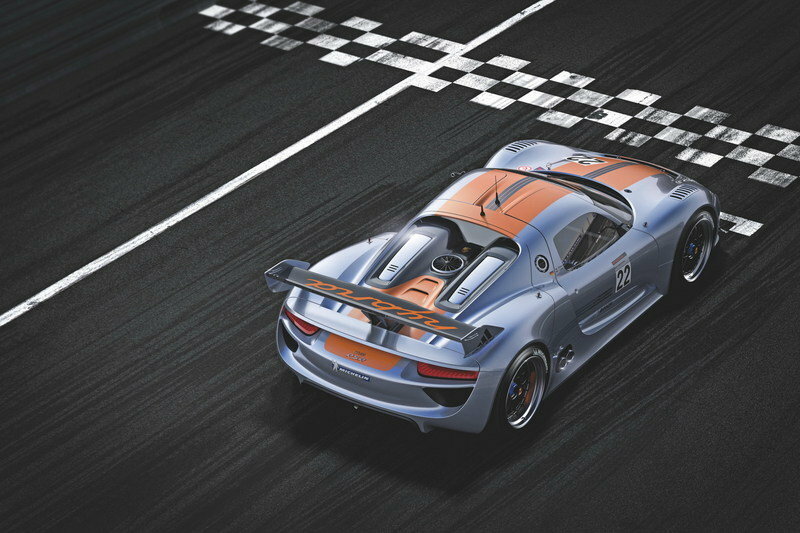 And like almost all the legendary Porsche racing models, the 918 RSR is painted in a new "liquid metal chrome blue" color combined with the typical Porsche hybrid orange color on its brake calipers and the body’s longitudinal stripes. The interior is also dominated by a racing theme. The bucket seat is covered in brown leather, and yes, we only said "seat" because the second seat has been replaced by the flywheel accumulator positioned to the right of the console. The interior aslo comes equipped with a racing steering wheel and a recuperation display on the steering column in front of the display screen that supplies the pilot with all the needed information. The cockpit is also split by a minimalistic console with rocker switches. 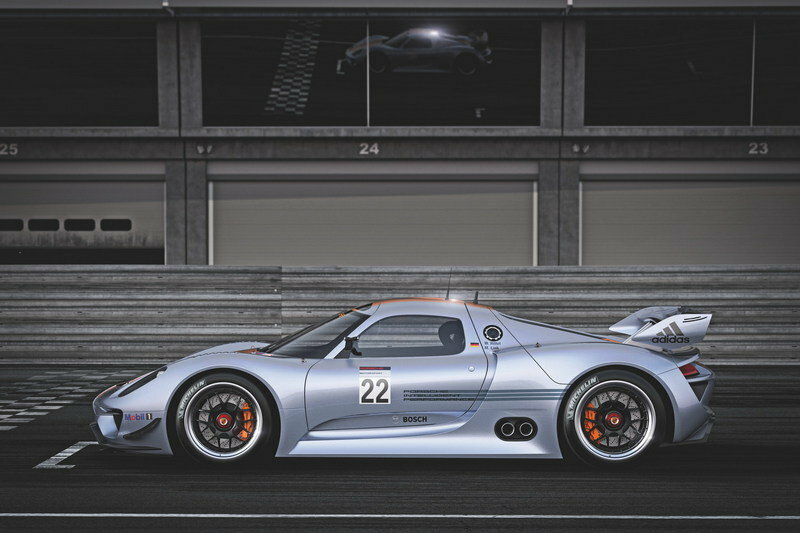 Like with the 918 Spyder, the 918 RSR is a concept vehicle. It combines a direct injection V8 engine that delivers 563 HP, with two electric motors on the two front wheels that both deliver an additional 150 kW. The result is an impressive 767 HP. However, the most impressive feature of the new 918 RSR is the flywheel accumulator that is, in fact, an electric motor whose rotor rotates at up to 36,000 rpm to store rotation energy. This accumulator is charged when the two electric motors on the front axle reverse their function during braking processes and operate as generators. 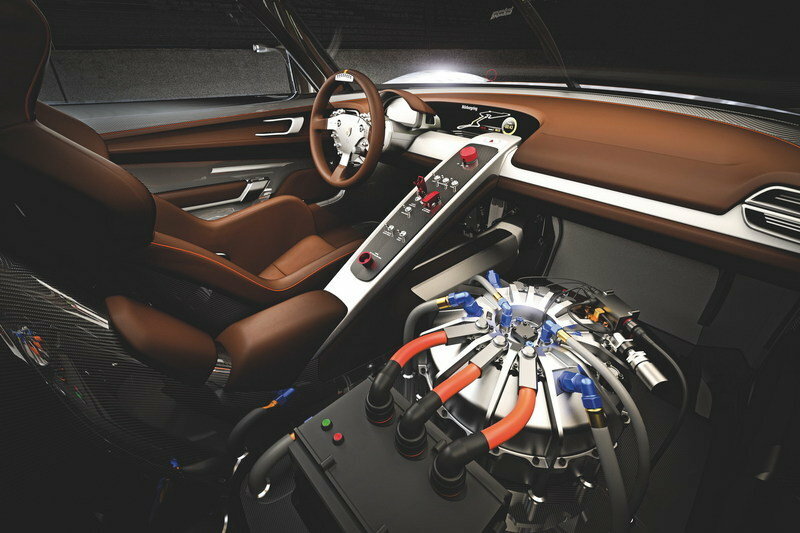 At the push of a button, the pilot is able to call up the energy stored in the charged flywheel accumulator and use it during acceleration or overtaking maneuvers. Porsche has yet to announce performance numbers for this impressive vehicle, but we bet it’s faster than anyone can possibly imagine. Like with its predecessors, the most important competition for the new 918 RSR Racing Lab will be in the Le Mans series. 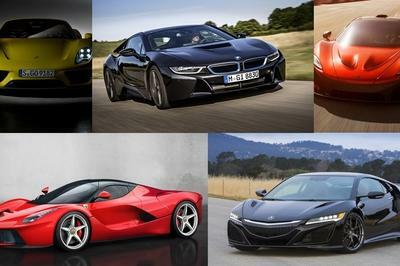 The list of the competitors here is very long and includes models from Peugeot, Audi, Aston Martin, and many more. The biggest challenge for Porsche’s new concept would be if Audi produced and entered a racing version of the R8 E-tron version. We wouldn’t be surprised if both of these vehicles ended up on the track at the same time, which would make the series that much more challenging. Well, you can’t. 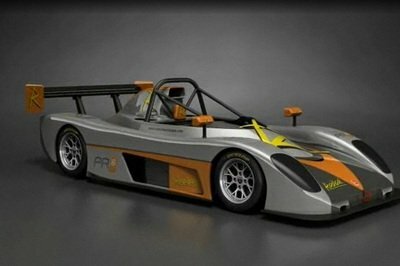 This concept is a racing vehicle that, if produced, would only be offered to private racing teams. As of now, Porsche hasn’t uttered a word on a production version, but if they did bring it in, we imagine it would be on the circuit by the end of 2012. 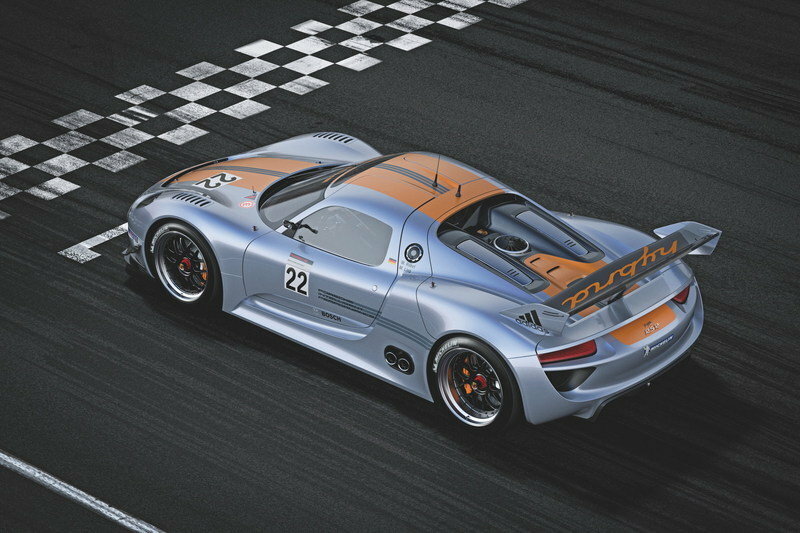 Since the Porsche GT3 RSR is priced at $510,000, we would think the 918 would see a similar price tag. With its highly-efficient flywheel accumulator, the 911 GT3 R hybrid racing car proved to be an attention magnet during competition racing on the Nuerburgring Nordschleife circuit, during the American Le Mans Series races (ALMS) in Road Atlanta/USA and the ILMC run in China’s Zhuhai. It demonstrated its massive performance potential under realistic motor racing conditions against top competitors. The 911 GT3 R Hybrid, referred to internally as the “Race Lab" actually surpassed the high expectations of Porsche Motorsport. Competitiveness, high reliability and exemplary fuel efficiency combined with top performance under-scored the Porsche technicians’ basic idea of generating additional power in an intelligent manner. The 911 GT3 R Hybrid obtains its additional power from its own vehicle dynamics when braking. Porsche is now transplanting this technology into the mid-engine coupé 918 RSR, the motor sports version of the 918 Spyder concept car. From the tradition established by classic Porsche long-distance race cars such as the 908 long-tail coupé (1969) and the 917 short-tail coupé (1971), the Porsche designers created a link to the postmodernism of the "form follows function" philosophy. 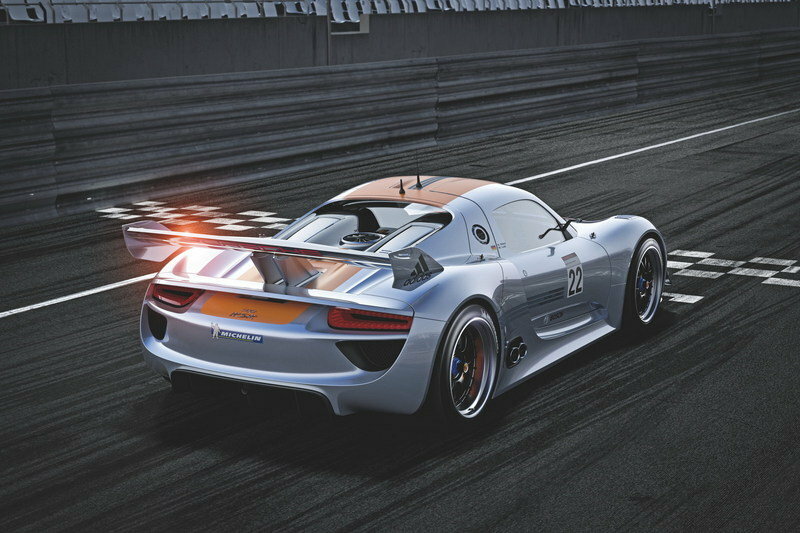 In the 918 RSR, the lines’ elegant flow is dominated by muscular wheel arches, dynamic air intakes and a pulpit-like cockpit. A visible fan wheel between the ram air intake tubes and a rear spoiler with RS Spyder dimensions additionally emphasize the racing laboratory function. The new "liquid metal chrome blue" color which has been created underscores the sculptured curves of the forms, whilst the typical Porsche hybrid orange color on brake calipers and the body’s longitudinal stripes lends remarkable touches. 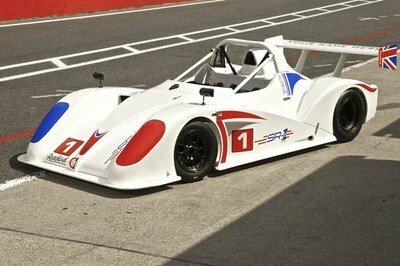 The vehicle’s functional equipment underscores its puristic motor racing character. Whether it be the characteristic doors which open obliquely upwards, the air intake in the roof between the wing doors, the quick-action locks on the front and rear CFRP lids, the two roof-mounted aerials for pit radio and telemetry, the RS Spyder-like small, lateral front flics or the air splitters beneath the front lip or no-profile racing slicks on 19" wheels with central locking, the vehicle can be clearly recognized as an experimental racing laboratory. In contrast to the 918 Spyder concept car, unadorned racing atmosphere predominates in the interior of the 918 RSR. The figure-hugging bucket seat’s brown leather covering cites the history of the gentleman driver; the gear flashes on the racing steering wheel and a recuperation display on the steering column in front of the display screen supply the pilot with information. Instead of the futuristic, ergonomically avant-garde centre console with touch-sensitive user interface from the 918 Spyder concept car, the 918 RSR’s cockpit is split by a minimalistic console with rocker switches. Instead of a second seat, the flywheel accumulator is positioned to the right of the console. With the new 918 RSR racing laboratory, Porsche is now elevating this motor racing hybrid concept to an experimental level. In the 918 RSR, “Porsche Intelligent Performance” equates to research into methods for further sustainable efficiency improvement under the intensified conditions of the race track, lap times, pit stops and reliability — a metier in which Porsche has been demonstrating its success for over 60 years. Finally, the starting number, 22, pays homage to the anniversary of a further triumph. Back in the days when overall victories in Le Mans were not yet an entirely routine matter within the Porsche racing department, the pilots Dr. Helmut Marko and Gijs van Lennep were the first to cross the finishing line in 1971’s 24-hour classic. The distance record set by their Porsche 917 short-tail coupé — 5335.313 kilometers (3315.21 miles) at an average speed of 222.304 km/h (138.13 mph) — did not remain unbeaten for an eternity, but for exactly 39 years until 2010. At the time, the 917 in the Martini colors was also an experiment and far ahead of its time: a magnesium space frame set new standards in Porsche’s lightweight construction domain. Clean and elegant design, but honestly, I’m not sure about the flywheel for the road-trip application, for sure seeing this baby a 10 thousand RPM is a very interesting one. It really looks lovely and stunning, and it is absolutely oozing with angst and aggressiveness on that platform and style. Moreover, it’s a good thing that it has a powerful and awesome engine. For me, it looks more like a next generation of Elise and exige, both car loos the same except for the longer wheel base and of course heavier engine. It really looks clean and elegant on its design, but honestly, I am not sure about the flywheel for the road-trip application, for sure seeing this baby a 10 thousand RPM is a very interesting one. Porsche 918 is really oozing with angst, and I love the graphic design of this vehicle! It only adds more aggressive and awesome appearance on it. Moreover, It’s a good thing that it has a very efficient engine which is suited on it. I have to agree with that, and I must say that I think I should give a benefit of the doubt for an electric vehicle just like on this Porsche. Well, I was also so amazed on its powerful output the fact that it is a hybrid motor. For an electric vehicle, it really amazed me that it could deliver an output of 767 horsepower, which is truly so impressed with it. Anyway, I love the aggressiveness of this race car. Well, I must say that I really love the angst of this sports car, and even if it is an electric vehicle, I noticed that it still had an impressive speed which is truly impressed me. This Porsche 918 is already a complete package for me for a race car. Aside from having an aggressive and impressive exterior, I’m also glad that it had a striking engine that can deliver a powerful horsepower. It had the most aggressive appearance that Porsche ever produced, and I can say that it is really so striking and awesome on that looks, but I wonder if it also had a striking interior and figure performance. V8 engine with two electric motors that can deliver 767 horsepower is really quite impressive on this race car, and I would admit that it is absolutely so striking on its looks, and I bet it can surely catch lots of attention. 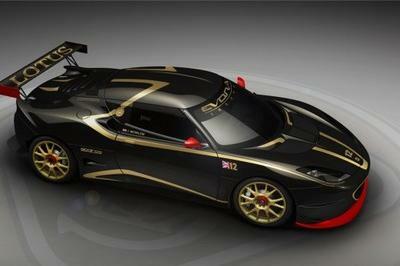 Outstanding top gear race car. One of the hybrid car. Pertaining to its motor definitely great powerful system. The appearance and car performance are impressively wise. I want to see this car in personal and i want to watch it in video. This car is one of the best race car for me. 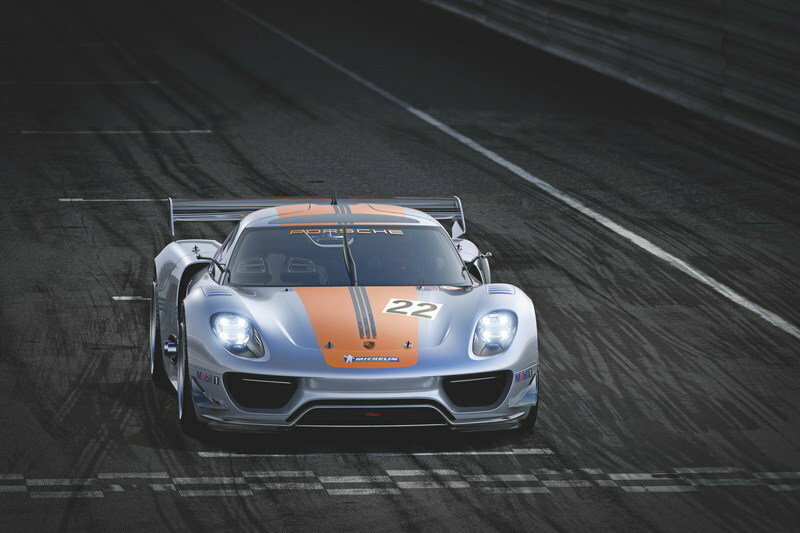 Porsche 918 RSR has 767 Horse power and V8 engine. This is enough to use this car. The interior part of this car is really great the engine is inside the car. I like it. I could see that happening that Porsche will have a lot of experience in actually racing the Hybrid Drive technology by 2012. I almost forget about that thing! I thought Porsche will be forming F1 team? Since, they have announced that they are capable in supporting their own team. Most of this racing car is not available in the market. And was done for exclusivity only. After finalizing the Porsche 911, I think Porsche can now focus on this one. I notice the interior of the car, and I wonder what are those accessories inside. By the way, I think the competition will be stiff since it will join in Le Mans race. Yeah, it’s simply impressive. However, its kind of sad that it’s not available in the local market. I would love to experience the speedy performance of the car. I wonder if this vehicle will join any racing competition and what would it be? 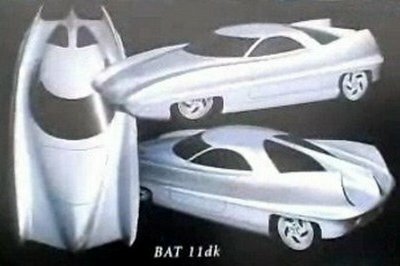 What the sense of waiting for this car when we couldn’t get one of this? Hell, I think it would be cool to drive this car. The deliver power output of the vehicle is kind of incredible. I wonder on what does the flywheel accumulator have to do on the car?